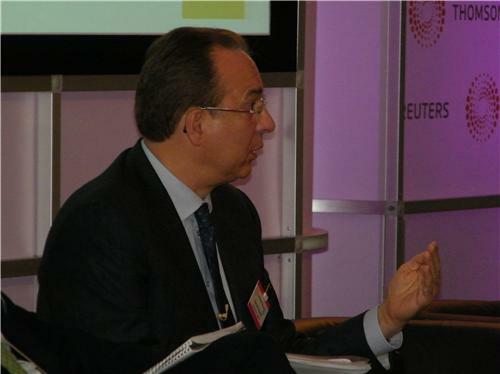 More than 200 top executives, strategists and researchers in EM DCM are scheduled to attend. The agenda covers sovereign (10:15), domestic (10:45) and corporate issuance (11:45), and syndicated loans (12:15) with a deeper focus on geographic regions in the afternoon. Jerome Booth: "All countries are risky. Emerging markets are ones where we have priced that in...Developed countries don't even perceive their own risk." Booth: Greece has no chance to get its fiscal programme where it needs to be. 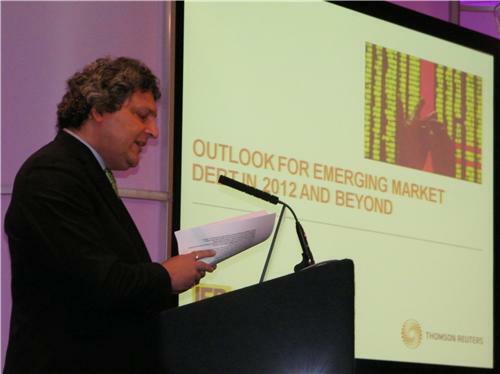 RT @jgmastrini: Booth: Greece has no chance to get its fiscal programme where it needs to be. Booth on US: Either you need have a big fiscal package with a big multiplier effect, or nothing at all. Tax cuts not useful because they will just go to savings. Booth: Full depression in the United States seen at 5-20 percent chance. Booth: We are now in a different world where we can think about risk in a different way... The phenomenon of deleveraging leaves emerging markets as beneficiaries. Booth: We are now in a different world where we can think about risk in a different way. #IFR-EM: Panel on the macro outlook has begun with Peter Attard Montalto of Nomura. Jonathan Fenby of Trusted Sources: The world has not worked out how to deal with China and its impact on global systems. Fenby: China is still a Communist country... the people who still matter are the 9 men atop the party with amazing heads of hair. Fenby: Their bottom line is to keep the Communist party in power. Fenby: In understanding China you have to start from inside. Risk factor is that the Communist Party runs its own rule of law. Fenby: If investing in China, invest in Hong Kong, not Shanghai. #IFR-EM Apoteker: Transmission risk adds to ex ante vulnerability. Cites Poland, Vietnam, Russia. Apoteker: The crisis has acted as a trigger for a long overdue EM correction. Strong correlation--carry trades and loss of competitiveness. Montalto: People taking very particular trades in EM (getting very close to policies on the ground). Likes South Korea, Chile, Czech Rep.
Benoit Anne of Soc Gen: Asian currencies are mis-priced, including the reminbi. No way China is immune to the crisis. Likes Turkish lira. IFR Editor-at-large Keith Mullin chairs the conference. Ash: "I don't see a huge increase in financing costs (in emerging Europe)". Hewitt is from Barclays Capital. Hewitt: After Greece, Europe will have lots of trouble getting people to buy the bonds of other countries. Hewitt: If Greece defaults there will be five or six months with no (sovereign) issuance (in peripheral countries). Niedringhaus: Investors in Russia not willing to take on FX risk and overlay credit risk. Niedringhaus: People would welcome a big liquid internationally open investment vehicle (in Russia). 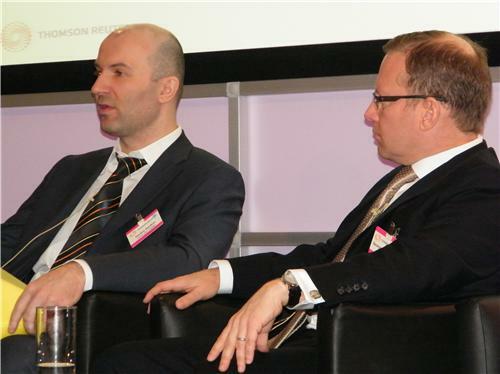 Dmitry Dudkin, head of fixed income research, URALSIB Capital (L), and George Niedringhaus, global head of syndicate, VTB Capital. In a break now. Morning talk so-far has focused on how quickly peripheral Europe/US/developed world crisis will transmit to EM. No consensus emerging. There will be varied impact, but money still can be made on the ground with local knowledge in EM countries.